Nylet - THE Master Sailmakers creating fine racing class yacht sails, replacement kit sails (and other sails). Comprehensive sailmaking service, world-wide mail order since 1958. At Nylet we don't just 'make' sails, we create sails, we breathe life into the sailcloth in order that they might be filled and shaped by the wind. A yacht's sails are its only 'engine' - so fit the best, don't settle for less. Please refer to our price list (over 600 items listed). More sails in our "150 sails" list. 2019 - 103 (combined) years of experience! Nylet IOM racing sails in racing scrim, white Dacron, and Mylar film. Also replacement kit sails; Classic Varnished Terylene sails, also "Heritage" 1960's style sewn white Dacron sails, which are made exclusively by Nylet. Any size sails, of any type, made to your drawings or templates. Also Premium 'Vintage' style cotton sails (page accessed via the drop down list). Nylet. Fine Products - Quality First. Photos of some Nylet class racing sails, replacement kit sails, and cruising sails. Also see both"sail gallery" pages. More Information on racing sails, replacement kit sails, and cruising sails. Finely cut and finished sails created with our renowned wind catching shape. Makers of premium NYLET "Heritage" sewn Dacron sails in 1960's style. Please refer to our price list first (more sails in the "150 sails" list). 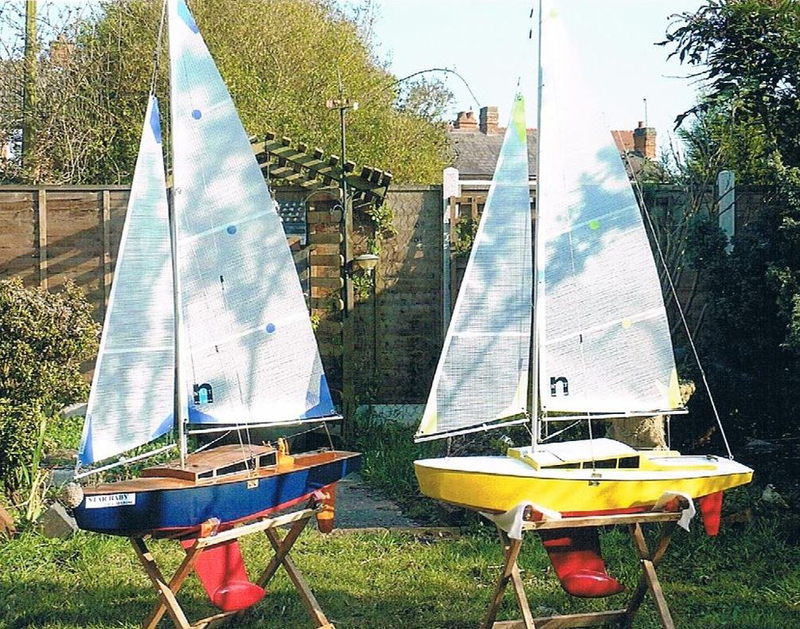 Nylet - model sailmakers to the world. THE professional sailmakers ~ 87 years. Fine products - Quality First - Sails made to order. 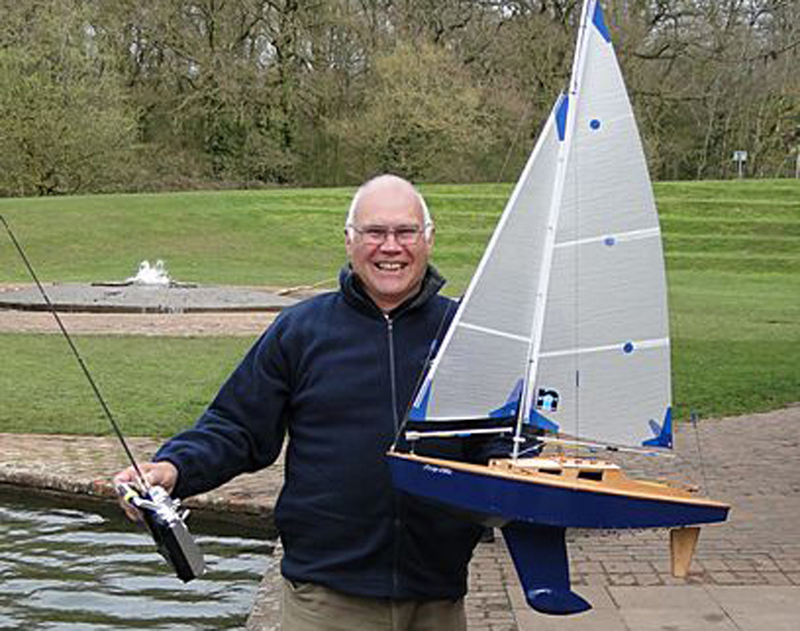 A milestone; 2016 marked Frank Parsons' 50th year of model sailmaking. His late father was a Master sailmaker, his company making full size yacht sails for ocean going racing yachts, working boats & dinghies, from 1932 and being Contractors to the Admiralty. 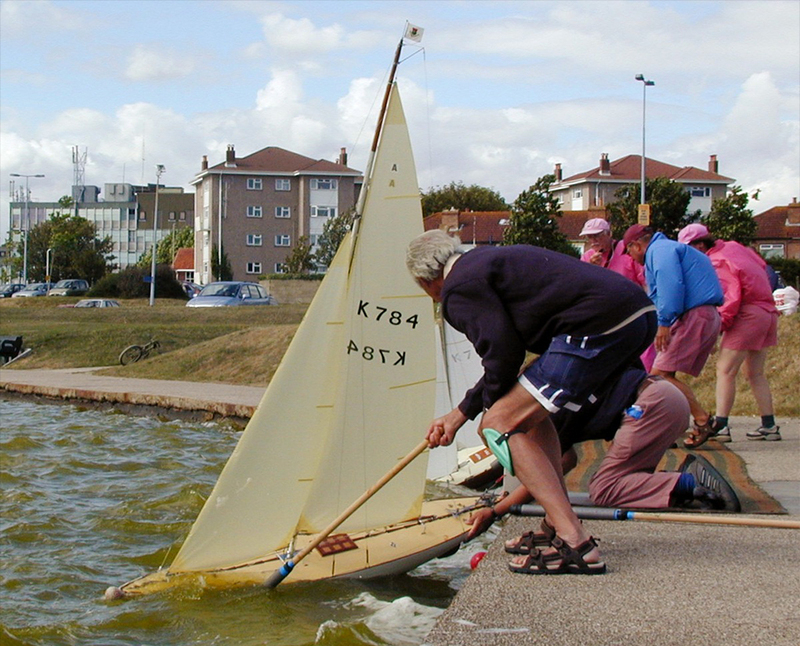 See this page for racing model yacht sails, replacement kit sails, also Heritage sewn Dacron sails (manufactured exactly as we did in the 1960's), and Varnished Terylene sails for the 1950's yacht. Synthetic sails priced from around £30. Sails see section F of our product & price list. Sail rigs, see section F2. Sailmaking accessories & racing numbers see E5 & 6; sailcloths are sold by the metre/piece, see section G (and text below). All orders for sails are made individually to the customers specific requirements, we do not hold any stock of sails, everything is custom made as you require. Send us your plan or drawing for a specific sail quotation. For more detailed info on sailcloths see 'news' via 'main pages' and select from the drop down list. REPLACEMENT KIT SAILS. We make sails for kit yachts such as the Victoria, Voyager 2, Fairwind, Seawind, Northwind, Thunder Tiger ETNZ, etc. Find those (and more) in section F4 of our price list. For full information of other sails click on 'info pages/help' on drop down list above and select '150 sails'. May we again stress that if the sails you are enquiring about having made aren't listed on our price list or the "150 sails" list then we must have sizes in the first instant to be able quote you, so please send those with your initial enquiry. We can't quote you without dimensions! See the link to our other page on 'vintage' style cotton sails. THE ORDERING PROCESS for standard sails listed in the price/product list (section 4). 2. Select the sailcloth/material you require and note that on your order. 3. Stipulate the type of mains'l luff, i.e. luff cord, or tabs, or eyelets, or maybe luff hooks (hooks are at extra cost). 4. Stipulate the colour of the corners. 5. Phone or email your order. For one off sails to your drawing, sketch, or paper templates, or for sails from our listings of available suits that we have measurements for, then please enquire with details and your choice of sailcloth. The advantages of buying Nylet sails: beautifully finished and carefully sewn sails, specially handmade to your order and with the trim colour you specify. They are not ex stock and so have not been stored for months rolled up; every suit is made to special order for the customer and with trim colour as selected. There is no 'cheaper' quality, sail prices start at around £40, they are the same high quality as more expensive suits but they just happen to be smaller. We take a pride in our work and every sail receives the same care and attention whether small or large, whether it is a 'standard' design or a 'one off'. Nylet sails. Sail suits are usually complete with battens, eyelets etc. (unless your specification shows otherwise). Corner patches can be applied in either white, black, blue, red, bright orange, bright yellow, grey, or green. There is no extra charge for coloured standard corners (see photos of sails) but 'fine' finger corner patches are at extra cost. Older designs. My late father's handwritten sail book includes older designs from the 1940's, 50's and 60's, and which includes names such as March Hare, Pocahontas, Genie, China Boy, Trapper, Bewitched, Bloodaxe, Skippy, 247, Cracker, Clockwork Orange, Highlander, Gem, Mosquito, Starlet, Gosling, and Mad Hatter, etc. More recent names are Micro Magic, Wee Nip, and Star Baby. A customer informed me that Peter Stollery sailed with a suit of our sails for some 12 years and finishing in first place more times than he could remember. How we make sails that are top league, have the finest finish and importantly a wind catching shape that will power your yacht. "Shape" is often the one thing that is not immediately obvious in a sail and having manufactured sails for almost ninety years we know exactly how to cut and shape them. The way to see this 'shape' is as follows - lay out the mainsail (as this is larger and will have more shape) on a table/flat clean surface. One of you holds the head of the sail while the other holds the clew in your right hand and the tack with your left hand (so the corner of the luff, the leading edge is in your left hand). Lift it off the table, apply a little tension to the luff, now slacken off the tension in the foot to allow it to 'belly' slightly; you will then observe the shape appear in the sail. Also squint down the luff, you will see it is not straight but has a subtle curve. Sails made by foreign kit manufacturers are often made in ripstock Nylon which isn't a satisfactory material for sails. Often these sails will have a luff which is wrongly cut/shaped, it might be a wavy 'dog leg' shape or it may be cut straight or even have a hollow; often the leech is cut on the bias which is disasterous. Any of these render the sail totally ineffective and about as useful as a tea towel! General information: IOM RIG KITS. 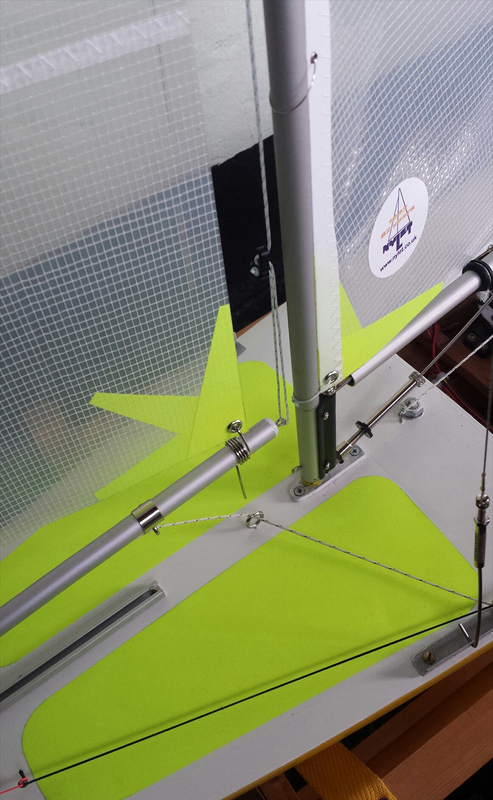 Sail rig kits for the One Metre (IOM) consist of a suit of racing sails, alloy mast & booms plus comprehensive fittings pack, with assembly drawings. A note about sizes of sails in our price list; often these are described as, for instance - Marblehead no.1 suit sails (1900mm) in panelled scrim. Where there are a multiplicity of different suits we pin down the size by the dimension of the mainsail luff (leading edge). Where there are fixed 'standard' sizes, such as the IOM class (International One Metre), suits are simply described as either number 1, 2 or 3 andwhich are sometimes called A. B, and C rig (no.1, or A, being the top, or lighter weather suit). Only 3 suits are allowed under that particular rule. Photos emailed to us of our sails rigged on your yacht are always welcomed, and we have created a gallery page for this purpose, in addition to the existing pdf file of sail photos. Sailcloths & sail materials expained (for sailcloth by the metre scroll down). We use the following materials - 3.6oz. Dacron is a more traditional woven synthetic sailcloth and is often used now for 'cruising' sails where a more traditional look is required. We have used this type of sailcloth since 1966 when it was woven in the UK under its trade name "Terylene". Dacron is available in white only; coloured Dacron is manufactured but in weights heavier than 4oz. which is unsuitable for model sails (be aware that these cloths are made for full size yacht sails). Laminate scrim is a very popular and durable nil colour light to medium weight material which is widely used by the racing skipper; virtually all IOM sails we are asked to make are manufactured in 'racing' scrim. We automatically apply the correct weight of scrim for the type/size sails ordered. Lightweight scrim and film suits may be edged with a fine transparent leech tape to maintain stability and sails such as the Wee Nip are made in the lighter weight scrim. 50 micron Mylar film; this material is available in 'clear' and is lightweight and resiliant (but very prone to taking a crease). It should be handled with care and used for lighter sailing conditions. Sails in this material are not considered to have a satisfactory life span of more than a season or two of racing. Sailcloths are also expained in "news" which is accessed via the drop down list (click on 'main pages'). Sailcloth by the metre, or piece (see section G of our price list). Making your own sais? White Dacron sailcloth is sold either by the cut piece or by the metre run - full details in the price list (and see postage rates for different postal charges). Scrim is sold by the metre/piece, also Mylar film. Vintage"Glyptol" (varnished Terylene) is available but we have the last dozen yards remaining off a bolt from the very final run loomed ( there will be no more); sold by the metre at 980mm width, there are some 'crinkles' probably due to being stored at the warehouse and so is sold at reduced price. Sailmaking materials & numerals, see sections 3, 5 and 6 of our Product & Price List. This includes various sail 'extras', also numerals (black 105mm) & sail insignias, double sided self-adhesive sailmaking tape, adhesive backed luff tape and sewing threads. Also coloured self adhesive Polyester patching for decking and patches, sail corners, etc and is sold in standard size rolls in various colours. Tips on setting/rigging your new Nylet sails (or any sail cut correctly). Rigging sails is not a 2 minute job, it is important to understand what you are trying to achieve. A badly rigged sail will not look right nor will it be able to do the job required of it. The control of the mast shape is 80% of achieving a well set mainsail; a jib is somewhat easier to set, but correctly placed shrouds (side rigging wires) are key to get the right mast shape. 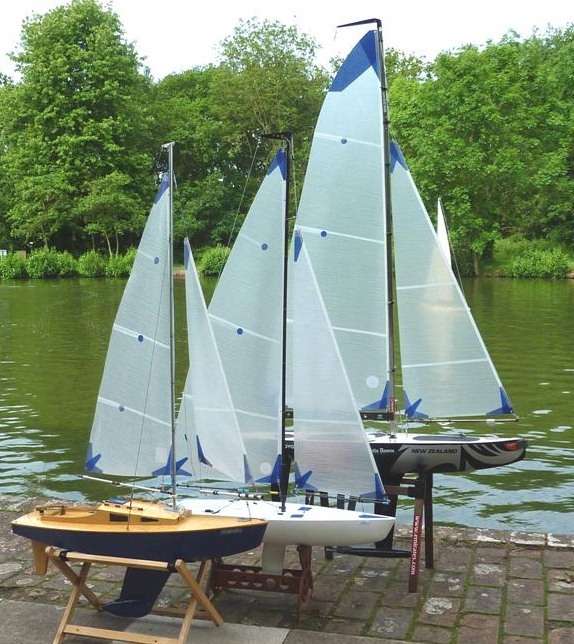 Play around with the yacht rigged at the pondside, or in your garden, on a day where light airs prevail. Lets say your yacht is rigged, so you then fit/attach the mainsail & jib. As you hoist/tension the main luff you will alter the set of the mast, and conversely as you alter the tension of the shrouds/forestay & backstay then the set of the mainsail will alter/deteriorate/improve. A whole chapter could be written on this subject, but the result is key to the yachts performance. Take time to watch how the sails shape alters, you need a nice amount of flow at the foot, a certain 'fullness' in the sail - if its as flat as a board then its terribly wrong - alter your rigging! A nice flow from the luff, no crinkles, no flatness, a smooth curve, it has to 'look right'. See our booklet the BB3 for more detail. Higher wind speed will require a certain amount of "hardening down" - that is to say tightening shroud tensions and 'flattening' the sail somewhat. Lighter air conditions will demand a slacker rig with more flow in the foot and easing everything so it allows the sails to fill at the slightest puff of wind. Different sails will be required for different conditions and most yachts will have three rigs/suits of sails for varying wind speeds and conditions. Ensure that the angle your jib makes from the centre line of the boat is MORE than that made by the mainsail. If it is the same angle, or worse still, LESS, then your jib with be 'backwinding' the mainsail. The jib is the mainsails partner and the 'slot' between the two is there to speed up the air flow on the lee side and this reduces the air pressure so the mains'l is 'sucked' into the area of lower pressure. This promotes correct sail shape and increases 'drive'. That is how a wing on an aircraft works, the air is speeded up (over the wing) and the lower air pressure area above induces 'lift'. Without that phenomenon an aircraft won't fly, and if you don't get it right then your yacht is going to perform indifferently no matter how good the sails are. Another chapter might be written on tuning your yacht! This needs to be on a day where a steady breeze prevails and not gusty or variable. This aspect of sailing is explored in our BB3 general "how to" booklet. Rigging yachts is also examined, as well as a whole plethora of other useful "stuff" (as a customer once commented). Just one observation, we are often (erroneously) asked for a 'set' of sails, actually there is no such thing, a 'suit' of sails is the correct term and will comprise as many sails that make up the number required for that particular yacht. For instance a normal Bermudan suit for a racing yacht comprise two sails, a mainsail and a jib (or foresail). The Robbe Atlantis suit comprises four sails, a suit for a gaff rigged working boat may comprise three or four or five sails, sometimes more. The more technical stuff on sails for older yachts. Section F7. Nylet "Heritage" sewn Dacron sails, fully sewn detail exactly as we manufactured almost 60 years ago in 1960's style. These sails are made exclusively by Nylet and are cut and sewn by me, Frank Parsons. They are generally suited to yachts built before the late 1960's (as an arbitrary point). Sails thus manufactured in synthetic Dacron sailcloth are made with fully sewn detail, sewn luff tablings (tapes) and with sewn corner patches, sewn battens (where necessary) and corner eyelets, with mains'l luff fixings as specified by the customer. Corner strengthening receives specially sewn detail. In the case of larger “class” yacht sails (A-class etc) an aluminium headboard can be fitted to the mainsail head. These sails are fully sewn thus replicating how Nylet sails were made in my father’s time nearly 60 years ago. Sewn sails can be made in one piece, that is to say, not panelled, or you may select panelled sails at extra cost. Towards the late 60’s, as Terylene became more widely used, the advantages of panelling become recognised. “Shape” for air flow is also worked into the luff of the sail so that you will enjoy the advantages of classic style and have sails that “fill” correctly and perform nicely. Heritage sails are made individually to your order in the same way as are cotton sails and therefore are very much "one offs". We will be pleased to quote on receipt of your requirements. Varnished Terylene Classic sails can be made in authentic Terylene cloth and in the style of Nylet sails in the 1950's and are prmarily suited to larger class yachts such as Marblehead, Ten Rater, and A-class. Varnished Terylene has to be loomed in one hundred thousand metres at a time. We have been lucky enough to secure some stock and we are informed that there will be no more, it is the very last piece of the very last run. Since it receives a coating of varnish (a heat applied process) it is a strong 'honey' colour. There are modern replicated varnished cloths but these are thinner and can tear, only our varnished Terylene cloth is the authentic material - however it is dwindling, as at this moment we only have enough remaining for a few suits. Cliff Grove at Grove Pond Yachts builds beautifully finished 'pond' yachts and which include a 6M and also a 36 inch as well as manufacturing vane gear units. If you prefer to purchase Nylet Dacron 'Heritage sewn sails' for your model then these are available, made specially to your order, direct from us. These are priced in our product & price list in section 4. Should you wish to have our "Vintage" cotton sails then we will be very pleased to quote. On a personal note, a milestone - in 2016 I celebrated 50 years of model sailmaking, and am pleased to say that I take great pleasure in my work, every sail I make is given equal attention to detail. This year, as a sailmaking family we have totalled 102 years of sailmaking experience when taken together with my late father, who taught me most of what I know. It might actually be 113 years if I reckon his early years working for his father and making sails for his own dinghy (which he built) in the mid 1920's before making sails commercially. I got the sails this morning at 10! Fantastic! They look perfect. Roland, Switzerland. Enjoying the new Seawind sails. Far more competitive than the stock sails. You are a star. Allan, South Africa. The Seawind sails have arrived, the only thing I can say is - WOW. What a difference compared with the standard sails. André, The Netherlands. Many thanks for the superb Seawind sails that arrived this morning. I really appreciate the speed of processing of the order, and the precision of the finished sails. Geoff, Cleveland. I was pleased to receive my new IOM sails today, they are very good indeed, just what I wanted, possibly the best I have ever had, good workmanship. David, Spain. Thank you for the suit of ETNZ sails; I must say that they look real stunners when bent onto the rig and the panels give them shape that the flat ones in the kit sadly lacked. Having sailed the yacht in conditions ranging from dead calm to 8mph with gusts in between I am extremely impressed with the performance of the sails in all the conditions encountered. 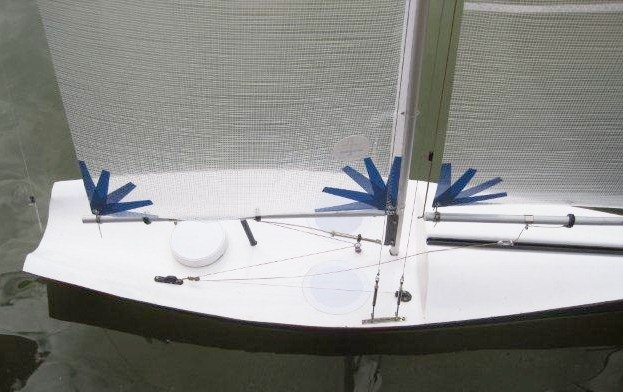 The information on your web site about jib set up was very helpful in respect of fitting a leech line (which I have installed) and one can now set the sail to a perfect shape to suit the wind conditions. The stiffeners in the top of the mainsail have also improved the performance dramatically. Excellent sails deserve better rigging than the kit provides to which end I shall look through your catalogue to see what I need to improve the rig. I think it will be prudent to get one of your BB3 booklets. Once again thank you for the sails and the prompt delivery service. Ian, High Wycombe. I have just received the ETNZ sails and they are beautiful, very well made. Never seen so good a job on radio control boat sails. Also very good packing. George. Greece. I think the sails look really great, excellent workmanship. This is the best thing I have done, so once again thank you very much. Eddie. Nottingham. Hello Frank, I finally finished the Victoria refurb, set up and sailed first time last Sunday, she sails brilliantly! Fantastic sails, thanks, the boat runs like a greyhound! Colin. Notts. The IOM sails are absolutely fabulous. Alan, Derby. The sails look great, lovely job and I cannot wait to sail the boat. Malcolm. Herts. Frank! The new sails are "ring-a-ding-dong dandies!" I am a happy customer. Thanks again. Rey. Canada. The Starlet sails are a perfect match, many thanks. Jim. Norfolk. Just to let you know that both parcels arrived yesterday. Lovely work too. Thank you very, very much. Arthur. Australia.
. . . to let you know that the (IOM) sails you provided me with a few years ago proved to be so good that I have had to make virtually no adjustments since, regardless of wind strength or direction. Taunton. I am still using the original top suit sails supplied by you in 1978 and they are as good as new! Yorkshire. The sails have arrived, beautiful as always, and very pleased with the white 'squared' Dacron. Chorley, Lancs. Thank you Frank, all your items have been excellent and I shall be ordering a storm rig later this month, many thanks again. Blyth, Northumberland. Just a quick note to say that the IOM sails are fantastic and getting used every day after work. Valencia, Spain. Just to let you know that I am very pleased with my Victoria sails (in scrim) and fitted them straight away. The yacht performs much better and is far more responsive to controls, she's almost as fast as a Marblehead now. Members of our club were very impressed also. I am happy to recommend your company to anyone interested. Alan. Worcestershire. Frank. I think the sails are beautiful. I can readily understand now why you were so pleased with them yourself. They will act as a spur to get on with the rest of the boat. John. Somerset. I tested the new suit of sails yesterday and was very impressed by the difference it made to both the appearance and the handling of the yacht. Thank you also for the very quick turnaround time on my order and the high standard of workmanship. I think that was excellent service. Colin. Christchurch. Sails arrived in Australia 28 Nov. They look superb and I must now complete the yacht; thanks. Geoff. Australia. Dear Frank & Co. Many thanks for the Northwind 36 sails, they look fantastic, and for the advice you gave during the ordering process. Alan. Southend-on-Sea. I've just received the Voyager II sails and everything is in good order, they look superb! Colin. Southampton. Thanks, I received the Star Baby sails, they are exceptional, very professional, and am thus very pleased with them. Mike. South Africa. Christmas greetings to you. Have finally got “Star Baby” onto the water and am exceptionally pleased with the sails & the performance, thanks to Nylet! As a first timer I am really enjoying the sailing. Mike from S.Africa, again! Sails arrived and look great, they certainly win the bank side appearance stakes. Thanks for a superb product. Richard. Horsham. Got the sails this morning. Brilliant. Thanks very much for a great personal service. I will be recommending you to others. Yorkshire. Just to advise safe receipt of my Voyager sails so recently ordered. They look superb. Impatient to set them to work now. Many thanks for great customer service. Reg. Newmarket. Glad to report all received. I love the (IOM) sails, the material and craftsmanship are fabulous. Rodney. Bury St Edmunds. The Star Baby sails arrived a week ago - they look excellent. Thanks so much for the prompt and friendly service. New Zealand. Once again an excellent delivery, the Victoria sails look very good, you are a pleasure to deal with. Brian. Ely, Cambs. Many thanks for the fast turnaround, the sails have been safely received and I must say I'm very impressed with the quality (first class). James. Surrey. A rival sailmaker said wistfully on seeing our work, "Really beautiful looking sails". Replacement sails arrived safely. As ever, the workmanship is first class with your meticulous attention to detail much in evidence. Gordon. Kent. Sails arrived today and they look really great. Have fitted them to my Starlet and am over the moon. Michael. Hants. To let you know that I have received my new sails today and am highly delighted. Steven. Northampton. 3rd April 2012. Tony emailed us again and said - you may remember that you supplied me with a lot of helpful information and new sails for my Thunder Tiger Voyager 2 in August 2010. Since then I've been using the boat regularly and the sails are as new looking as when I first received them and are doing the job as well as ever. As a result I've posted an update and three photos on RCGroups. Just received the Voyager II sails perfectly packaged, you seem to have made an amazing job on the sails especially on the stitching; looks promising on the yacht. Thank you for your top notch service. Francois. France. Hello Frank,the (Voyager) sails have arrived today in perfect condition and they look beautiful! Thank you very much for the nice work! Hope to work with you again in the future. Patrick, Belgium. M-class sails arrived and absolutely fantastic, really pleased and more than happy to recommend your workmanship. Lee, Berkshire. Thanks again for the sails, excellent quality. John, Fife. Sails received with thanks. You are a true craftsman. Glasgow. Dear Frank, many thanks for the new sails for my 60 year old yacht. The maiden voyage took place yesterday, quite windy conditions, and she behaved impeccably for an old lady. I am extremely pleased with your service, again, many thanks. 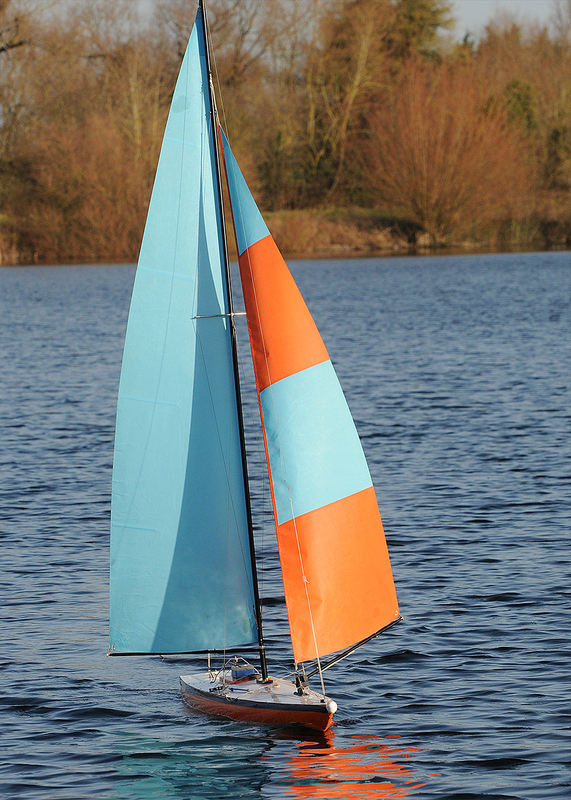 I am pleased to have been able to resurrect a boyhood dream of sailing my model. Mike, Shropshire. I just wanted to say a really big thank you for the lovely suit of (Dacron Heritage sewn) sails you have made for my vintage 4 foot model J Class sloop. I have put the sails on the spars and they look superb! They are beautifully made as I expected them to be, but in all fairness it is actually better than I had even hoped for. John. Preston. Just to let you know that my (Heritage sewn Dacron) sails arrived at 10.00 am this morning. Absolutely perfect Frank, the workmanship and quality is faultless and the accuracy to the originals is superb. All I have to do now is to continue with the restoration to the same high standard. Julian. Dorset. Hi Frank, sails arrived today as you predicted ... thank you again for another perfect job. Rod, York. I have received the Victoria sails in excellent condition, thank you very much for making them so quickly, a very happy customer. Mike, North Devon. Thanks for your message that the (One Metre) sails have been posted, they arrived 15 mins ago, they look excellent, a good job well done. Iain, Oxford. Once again my heartfelt thanks for your advice and the marvellous sails you have provided. Rob, Wiltshire. I had various recommendations of who to get sails from but the other day I saw a yacht with your sails and it just shone out, the shape looked beautiful, so I decided there and then to contact you. Gordon, Sussex. And with thanks to all our customers who kindly took the trouble to write, email or phone us to pass on their thanks. We can't display everyones comments but each one is gratefully accepted, each expression of thanks means a lot to us. The Microtransat Challenge is a transatlantic race of fully autonomous sailing boats. The race aims to stimulate the development of autonomous sailing boats through friendly competition. February 2013-18. Supporter of Robin Lovelock in his attempt on crossing the Atlantic with his yacht Snoopy. Yacht Snoopy is “powered” by Nylet sails for the next attempt to cross the Atlantic. This is one of several help and advice pages which explain our services. NYLET ~ Fine products ~ Finely finished handmade sails ~Quality First ~ 87 years. J.Parsons & Son ~ F.Parsons ~ Nylet. 1834-2019 ~ 5 generations ~ 185 years of manufacturing. Nearly 300 years experience of full size sailing (from 1730) !